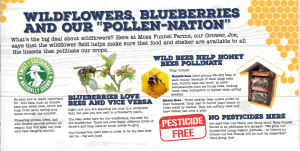 Moss Funnel Farms (Joe's Blues) grows blueberries using organic practices on its 10-acre farm in Bangor, Michigan. 2018 marks the tenth year the farm has been operating. The farms also serves as a food hub for other small organic methods growers in the area and markets fresh and frozen blueberries plus a number of value added products under the Joe's Blues label. 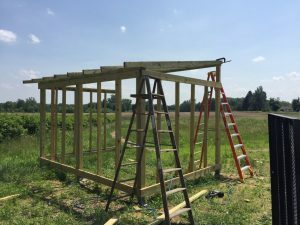 The farm is Michigan Agriculture Environmental Assurance Program (MAEAP) environmentally certified and has participated in Food Safety Modernization Act training. While there has been much media coverage in the last few years about massive die-offs in pollinator populations and the threat this poses to agriculture, the need to demonstrate the importance of pollinators to the food supply to the public has been spotty and mostly limited to broad and superficial coverage. 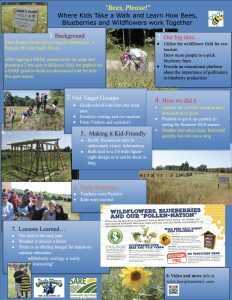 The purpose of this SARE education/demonstration project is to provide an on-farm educational experience that graphically shows local residents and summer visitors to Michigan’s fruit belt the ecology of pollinators in a commercial blueberry habitat. 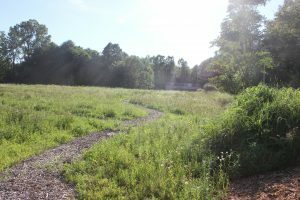 A pollinator education trail will be designed and constructed in a wildflower field adjacent to a producing blueberry field. The field and trail will also include hands-on activities for kids, and two special 2018 field days for educators. Measureable results will provide a basis for measuring the effectiveness of this approach. Share findings of this agro-educational effort via field days, a conference presentation and social media. While our approach to this project has been validated and the project has achieved its objectives, we faced significant problems along the way. We feel, however, that we have overcome them. Problem 1 – Weather. Our timeline was ambitious, but we felt, achievable. 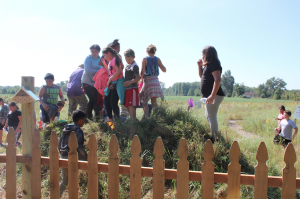 We already had a site, a second year wildflower field, and knew what we need to do – build a trail and shelter, and develop and install educational signage. The weather did not cooperate. We had a very cold spring, followed by periods of intense heat and high rainfall during May and June. We were able to layout and build the trail in this period. However, we had to endure intense heat during construction of the shelter and that slowed our progress. Because of those delays, we were not able to open the shelter and trail in time for the summer visitor season. The trail actually opened about mid-August so we were not able to establish data to measure change during the summer season. Problem 2 – Costs. Because of unforeseen costs for building materials, we ended up spending more on the shelter than we had anticipated. Luckily, we were able to make adjustments in our budget that mostly covered those costs. Frankly, we also had to eat some of those increased costs. We expect awareness and visits to grow over time. Installed an exit sign with both a QR code and the website info. Built a brief questionnaire for visitors and teachers. Offered a small incentive (wildflower seeds) for completing the questionnaire. In addition, we are asking school groups to contact us also via our website in advance, so we can get data on school visits. – Metric: measure the increase in number of frames in a new hive over the course of summer. This hive is located not far from the Education Center. Growth of frames will be used as indicator of pollinator health. We have a new member of our farm team who has suggested offering schools, individuals and groups sponsorship of a hive for 2019. The hive would be curated by Moss Funnel Farms, possibly in conjunction with the local beekeepers association in Kalamazoo. 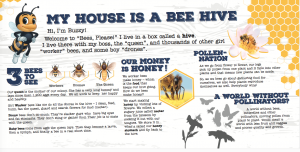 Sales of honey produced by the hive would go back to the sponsoring organization. – Metric: measure media coverage of our efforts and what slant they take. Greater public awareness of the benefits to fruit production of pollinators and pollinator habitat can result in increased support for government aid and regulatory programs that focus on protecting public health and the environment. On a national basis, this story seems to have “legs” and will be around for quite a while. We feel our facility will provide a local angle for national stories and because of the great visual aspects of Bees, Please! we believe coverage of pollination and fruit will continue to grow. 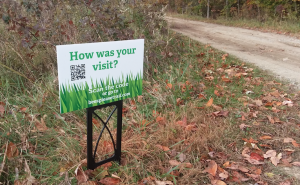 Increase in visits to the farm as a result of the exhibit (trail). Increase in retail sales at the farm’s market. Because of the late start for the Trail and Education Center, we will have to defer measurement of these metrics to 2019. However, our flyers have already become a permanent part of the State Welcome Center near New Buffalo and the local South Haven chamber, both of which are focused on economic tourism. -Metric: Trailhead questionnaire administered via paper and/or via smart phone. We have already instituted this evaluation system (see “Results” above). The YouTube video of our opening with 90 local 5th Graders shows appeal of the project among kids of diverse backgrounds. 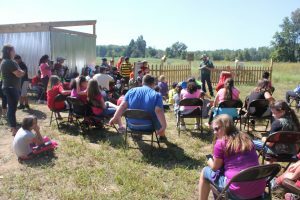 A new model for low-cost on farm education that can be linked to summer tourism and utilized by other farms to increase visits. We hope this project will also spur other farmers to add similar eco-tainment and agrotourism projects to their farm that will promote sustainable agriculture in a cost effective manner. We reached out to other farmers in our community, however, while September is ideal for reaching the ultimate audience, children, it is a very busy time for farmers. Also, a project such as this has a limited appeal to farmers, we believe. Farmers interested in agri-education might be interested, but there are not many. Farmers with u-pick and farm market operations would be interested because such an attraction would draw visitors as well as schools. Constant Contact email invitations were sent out four times to a list that included key teachers and administrators from nearby schools. We will be continuing to contact these schools and staff to encourage attendance. 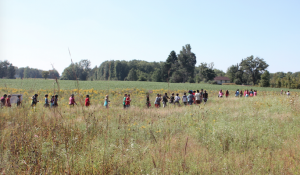 For the field day conducted on September 14, 2018 there were six elementary school teachers in attendance, an extension specialist, a member of the Van Buren conservation district staff, an NRCS staffer present, a professor of entomology from Michigan State and a grad student present. In addition a representative of U.S. Senator Debbie Stabenow was present. Five teacher Evaluations were received. All were positive but two noted that the day had been hot and that the crowd size was large. Two of the teachers said the material was outside their area. A teacher involved in a unit titled “systems and survival” noted the it had been “a great opportunity for them (the kids) to hear (this material) in a great setting and (get some) hands on.” Here is a copy of the teacher feedback form. The event was preceded by two articles that appeared in the South Haven Tribune. The opening of the Bees, Please! trail was the lead article in the state-wide farm e-letter, Morning Ag Clips on September 21. 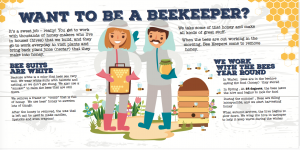 On December 4, 2018 at the Great Lakes Fruit, Vegetable & Farm Market Expo, held in Grand Rapids, the Bees, Please! 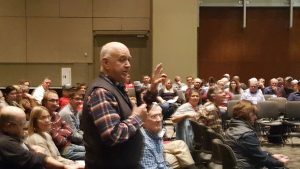 Project Manager presented a summary as the lead-off participant (below, left) at the “Farm Marketing and Agritoursim Roundtable”, attended by approximately 150 people from Michigan, a number of other States and Canada. 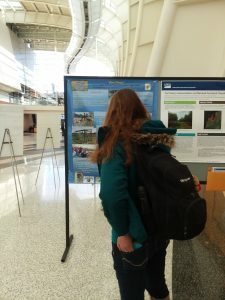 In addition, a 3 ft x 4 ft poster presenting highlights of this SARE project was on display in the Main Hall throughout the Expo. Connection to local school districts is very important. Deciding what content to include needs to take into consideration the age of the intended audience. The three panels below were developed for an audience of 3rd to 8th grade. Creating awareness and increasing attendance is not immediate. It takes time.